Discovered in 1879 Mesopotamia by British archaeologist Hormuzd Rassam, the Cyrus Cylinder was made of clay in a cylindrical shape about 23 cm long and 10 cm at its widest (smaller than an American football). The Cylinder was made sometime after 539 B.C. (sixth century B.C.) when Cyrus the Great defeated Babylon. 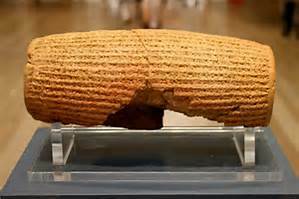 Inscribed in Akkadian cuneiform, the Cyrus Cylinder speaks of Cyrus the Great, king of Persia (reign 559-530 B.C.) and his capture of Babylon's last king, king Nabonidus. It is a memorial of the victory over Babylon and the greatness and magnanimity of the king of Persia. The Cylinder functions in part as a propaganda tool to endear the citizens of the former Babylonian empire to their new Medo-Persian king and legitimize his conquest. The first third of the Cylinder's script is in the third person and portrays Nabonidus as an oppressor. In response to the cries of the people, the Babylonian god Marduk chooses Cyrus and helps him to become the new ruler of the empire which is received with joy by its citizens. The latter two thirds of the Cylinder's script is in the first person. It begins with Cyrus' genealogy as a king of royal lineage and portrays him as a king who pleased Marduk and received his blessing. King Cyrus shares his concern for the peace and prosperity of the Babylonians and restores their worship of Marduk. According to the Bible, Cyrus the Great is notable for his repatriation of the Jews to their homeland, restoration of the Temple and freedom to worship the one true God (2 Chron 36:22-23; Ezra 1:1-4; 4:3; 5:13-6:13). 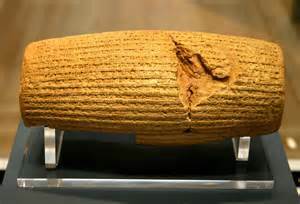 While the Cyrus Cylinder does not specifically name the Jews, the Cylinder speaks of releasing captured foreigners to their former lands, returning their religious items and restoring their cults. To gain a better understanding of Cyrus the Great, this is the most current translation of the Cyrus Cylinder by Dr. Irving Finkel of the British Museum. The convention […] indicates that the cuneiform was broken or unreadable. [When …] … [… wor]ld quarters […] … a low person was put in charge of his country, but he set [a (…) counter]feit over them. He ma[de] a counterfeit of Esagil [and …] … for Ur and the rest of the cult-cities. Rites inappropriate to them, [impure] fo[od- offerings …] [dis]respectful […] were daily gabbled, and, intolerably, he brought the daily offerings to a halt; he inter[fered with the rites and] instituted […] within the sanctuaries. In his mind, reverential fear of Marduk, king of the gods, ca[me to an e]nd. He did yet more evil to his city every day; … his [people…], he brought ruin on them all by a yoke without relief. Enlil-of-the-gods became extremely angry at their complaints, and […] their territory. The gods who lived within them left their shrines, angry that he had made them enter into Babylon (Shuanna). Ex[alted Marduk, Enlil-of-the-Go]ds, relented. He changed his mind about all the settlements whose sanctuaries were in ruins and the population of the land of Sumer and Akkad who had become like corpses, and took pity on them. He inspected and checked all the countries, seeking for the upright king of his choice. He took under his hand Cyrus, king of the city of Anshan, and called him by his name, proclaiming him aloud for the kingship over all of everything. He made the land of the Qutu and all the Medean troops prostrate themselves at his feet, while he looked out in justice and righteousness for the black-headed people whom he had put under his care. Marduk, the great lord, who nurtures his people, saw with pleasure his fine deeds and true heart and ordered that he should go to his city, Babylon. He had him take the road to Tintir, and, like a friend and companion, he walked at his side. His vast troops whose number, like the water in a river, could not be counted, marched fully-armed at his side. He had him enter without fighting or battle right into Shuanna; he saved his city Babylon from hardship. He handed over to him Nabonidus, the king who did not fear him. All the people of Tintir, of all Sumer and Akkad, nobles and governors, bowed down before him and kissed his feet, rejoicing over his kingship and their faces shone. The lord through whose trust all were rescued from death and who saved them all from distress and hardship, they blessed him sweetly and praised his name. I am Cyrus, king of the universe, the great king, the powerful king, king of Babylon, king of Sumer and Akkad, king of the four quarters of the world, son of Cambyses, the great king, king of the city of Anshan, grandson of Cyrus, the great king, ki[ng of the ci]ty of Anshan, descendant of Teispes, the great king, king of Anshan, the perpetual seed of kingship, whose reign Bel and Nabu love, and with whose kingship, to their joy, they concern themselves. When I went as harbinger of peace i[nt]o Babylon I founded my sovereign residence within the royal palace amid celebration and rejoicing. Marduk, the great lord, bestowed on me as my destiny the great magnanimity of one who loves Babylon, and I every day sought him out in awe. My vast troops marched peaceably in Babylon, and the whole of [Sumer] and Akkad had nothing to fear. I sought the welfare of the city of Babylon and all its sanctuaries. As for the population of Babylon […, w]ho as if without div[ine intention] had endured a yoke not decreed for them, I soothed their weariness, I freed them from their bonds(?). Marduk, the great lord, rejoiced at [my good] deeds, and he pronounced a sweet blessing over me, Cyrus, the king who fears him, and over Cambyses, the son [my] issue, [and over] my all my troops, that we might proceed further at his exalted [command]. All kings who sit on thrones, from every quarter, from the Upper Sea to the Lower Sea, those who inhabit [remote distric]ts (and) the kings of the land of Amurru who live in tents, all of them, brought their weighty tribute into Shuanna, and kissed my feet. From [Shuanna] I sent back to their places to the city of Ashur and Susa, Akkad, the land of Eshnunna, the city of Zamban, the city of Meturnu, Der, as far as the border of the land of Qutu – the sanctuaries across the river Tigris – whose shrines had earlier become dilapidated, the gods who lived therein, and made permanent sanctuaries for them. I collected together all of their people and returned them to their settlements, and the gods of the land of Sumer and Akkad which Nabonidus – to the fury of the lord of the gods – had brought into Shuanna, at the command of Marduk, the great lord, I returned them unharmed to their cells, in the sanctuaries that make them happy. May all the gods that I returned to their sanctuaries, every day before Marduk and Nabu, ask for a long life for me, and mention my good deeds, and say to Marduk, my lord, this: “Cyrus, the king who fears you, and Cambyses his son, may their … […] […….]." The population of Babylon call blessings on my kingship, and I have enabled all the lands to live in peace. Every day I copiously supplied [… ge]ese, two ducks and ten pigeons more than the geese, ducks and pigeons […]. I sought out to strengthen the guard on the wall Imgur-Enlil, the great wall of Babylon, and […] the quay of baked brick on the bank of the moat which an earlier king had bu[ilt but not com]pleted, [I …] its work. [… which did not surround the city] outside, which no earlier king had built, his troops, the levee from [his land, in/to] Shuanna. [… with bitume]n and baked brick I built anew, and [completed its wor]k. […] great [doors of cedarwood] with copper cladding. [I installed all] their doors, threshold sla[bs and door fittings with copper par]ts. […] I s[aw within it] an inscription of Ashurbanipal, a king who preceded me, […] … […] … [… for] ever.